For fans of Leigh Bardugo, The Lies of Locke Lamora, and Mistborn, here’s an upcoming novel from Tor that we’re excited about. 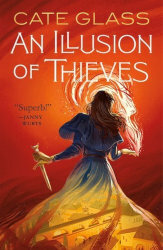 On May 21, 2019 Tor is publishing Illusion of Thieves by Cate Glass, a high fantasy adventure in which a ragtag crew with forbidden magic must pull off an elaborate heist and stop a civil war in this new fantasy adventure. In Cantagna, sorcery is punished by death. Romy escaped her hardscrabble upbringing when she became courtesan to the Shadow Lord, a powerful and revolutionary politician. But when her brother is caught using magic, her influence with the Shadow Lord is the only thing that spares Neri’s life -- and the price is her dismissal. Now back in Beggar’s Ring, she has only her wits and her own secret magic to help her and Neri survive. But when a plot to overthrow the Shadow Lord is uncovered, only Romy knows who may be to blame and how to stop them. If she hopes to keep her city from civil war, and her life, Romy will have to use the very thing that got them into this mess — magic. CATE GLASS was born and raised in Texas, and now resides in the foothills of the Colorado Rockies with her husband and three sons. · OCEANS 8 MEETS SCOTT LYNCH: Elaborate heists are a fantasy favorite (e.g. The Lies of Locke Lamora; Six of Crows; Mistborn) and AN ILLUSION OF THIEVES is a perfect new addition to the genre. · FEARLESS WOMEN: Readers are hungry for female-driven fantasy adventure, and Tor is leading the charge with authors like Cate Glass and our #FearlessWomen campaign. · YA TRENDS: Currently on the bookscan bestseller charts, 18 of the top 20 YA SFF authors are female, and as their fans age up, they will be looking for female voices and female-driven adventure like Cate Glass's AN ILLUSION OF THIEVES. · HIGH FANTASY ADVENTURE: Our heroine and her ragtag crew must steal a highly guarded magical artifact in order to stop a civil war from breaking out -- it's tense, epic, intricate, and our heroes use fun, unique magic to pull it off.